Wasp: You're gonna become a girl? Loki: I'm neither bound by your mortal limitations nor your simplistic definitions. I'm a god and a goddess. A man and a woman. I'm whatever I choose to be until I choose to be something different. Wasp: I just realized I get to make you a dress! Wasp: You look so good! 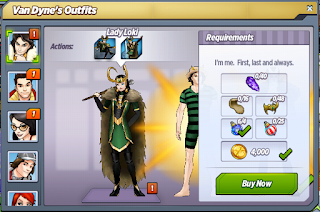 Lady Loki: I always look good. 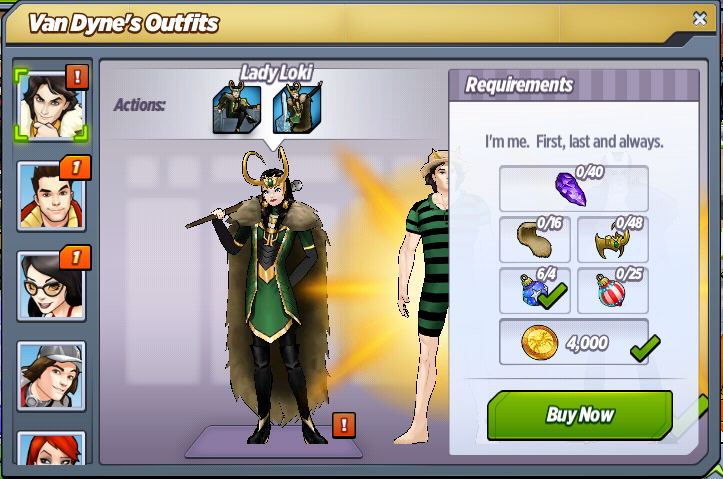 Wasp: Let's try on more dresses! Odin: I trust you haven't taken this form solely for the sake of mischief. Lady Loki: Would you believe me if I told you my intentions were pure? Odin: Just be careful on the steps, Loki. It's been a long time since you walked in heels. Lady Loki: These are clearly wedges. Lady Loki: That chair is horribly uncomfortable. I suddenly understand mother's love of throw pillows. Odin: The chair isn't supposed to be comfortable. It forces you to focus on what's happening in court, and serves as a reminder to get up and stand with your subjects. Odin: Once a day, I must enter a deep sleep known as the Odinnap to renew my godly powers, and extend my life. Lady Loki: Nice try, but I think it has more to do with the daily Odinbreakfast that consists of swallowing turkeys whole. Lady Loki: I've been so impressed with you powerful female heroines that I decided to take a form more befitting of your team. She-Hulk: You wanna join A-Force? Lady Loki: I want to help you achieve our shared goal of closing the Casket of Ancient Winters. She-Hulk: No offense, but how do I know we can trust you? Lady Loki: I used my own Frost Giant physiology to craft a spell capable of weakening their forces. It should allow us to get our hands on the Casket of Ancient Winters. She-Hulk: So you're a god and a goddess, and a guy and a girl, and a Frost Giant and an Asgardian, and a hero and a villain...Is there anything you aren't? She-Hulk: Well, I talked to everybody, and we're completely cool with you joining the team. Nico splits her time with the Young Masters of Mystic Arts, so we could use another sorcerer. Lady Loki: The green one asked me to collaborate with you on a plan for getting close to the Casket of Ancient Winters. Lady Loki: My fun will come from getting my hands on the artifact. Lady Loki: I suppose you're right. Why settle for something when you can have everything? Lady Loki: And what exactly am I doing? America Chavez: Wasting a chance at a fresh start. We're willing to be your teammates. Your friend. No questions asked. Don't ruin it by being greedy. And don't even think about hurting anyone I care about. Lady Loki: I'm immortal. Friends come and go. The only thing that is constant is power. America Chavez: Did you read that in an evil fortune cookie? C'mon, Loki. You don't have to always have your shields up. We're willing to accept you. Exactly as you are. Lady Loki: What if I'm not worthy? America Chavez: Who cares what a hammer thinks? It's about what you think. What your friends think. I personally think we should go sit in the quad, and make fun of Malekith. America Chavez: Welcome to the team. What do you think of Lady Loki? Were you able to get her?